We had a lot of sit down time in our work and times when we worked quietly, but also a lot of times of talking to each other. And a lot of recipe exchanges, like the one I am about to share. 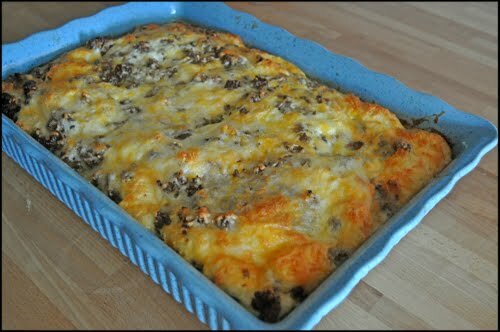 This particular casserole made it's debut on one 'breakfast meeting potluck thingy' a concept that was totally alien to me until then. I loved it. 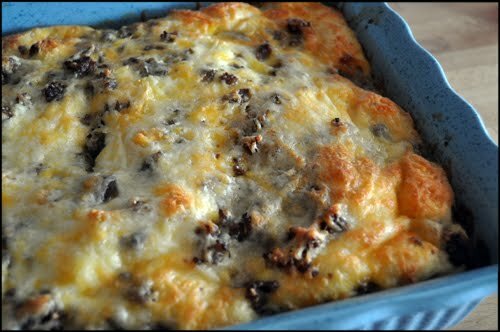 And I loved this casserole. It was so different than anything I ever had before, I don't even think I ever had breakfast sausage meat until then, I probably just went with familiar bacon and ham on occasional breakfast in a diner or when I was cooking at home. But boy, was this dish a game changer. I never have bacon and ham anymore, I always go with sausage. Breakfast sausage and me are buddies. It is one of the most comforting flavors to me. Needles to say, first Monday after the breakfast pot luck I asked Kathy for her recipe. She said it's just something she often throws together for her large family get-togethers. Well I wanted to just throw it together for my little family too, so she gave it to me, and I love making it, following instructions from that little hand written recipe on a scrap piece of paper she gave me that morning. I love good memories. So, here it goes. One tip I have is, make it the evening before if you want to serve it for breakfast and let it sit and soak in the fridge over night. It is soooo much better than just giving it one to two hours of soaking. Plus it makes it sooo much easier to just throw it in the oven in the morning. It is hard enough to wait for it to bake and cool of a little. And that would be the second tip. You MUST let it cool of a little. Give it 45 minutes to an hour. It just needs that time to rest and become what it needs to be before it's ready to be eaten. Needles to say, leftovers are awesome! 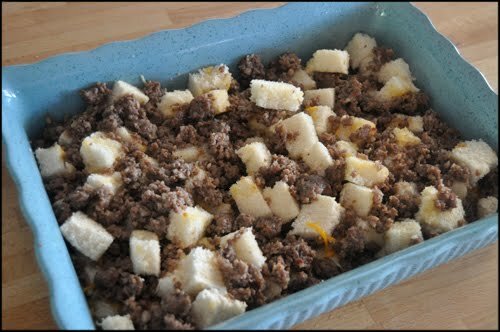 Butter you casserole dish, I used 9x13 one, and put bread cubes on the bottom. Brown your sausage in a pan. Cover the bread with half of your cheese and then put the sausage on. At this point I usually mix it up just a little bit with my hands. 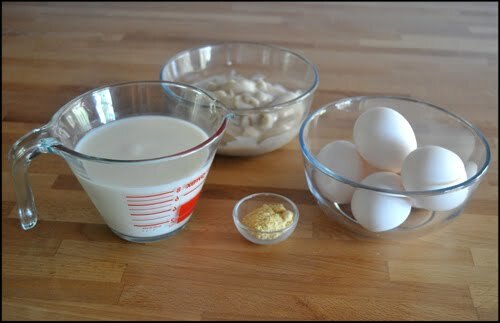 In a bowl beat your eggs, then add milk, cream of mushroom, dry mustard and salt and pepper. 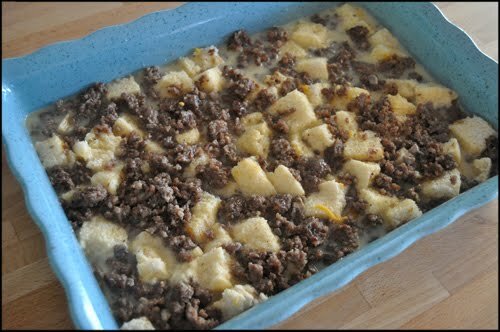 Mix well and pour over the casserole. Cover with plastic wrap and put in the fridge for at least one to two hours. I recommend doing it the night before and letting it sit over night. Preheat the oven to 350 degrees. Take the plastic wrap off and bake for one hour. 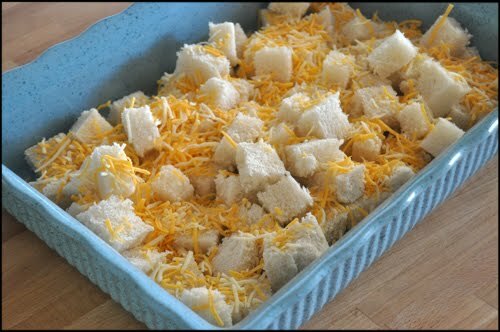 Then take out of the oven and out the other half of your cheese on top. Bake for another half hour and then check with a toothpick to see if it's done. I usually bake it 1 and 1/2 hours to 1 hour and 45 minutes. You don't want it to be very soggy inside, but letting it rest long enough helps with that. That is why the leftovers are even better. I hope you and your family enjoy this recipe as much as we do. Sometimes I ask myself would it be THAT good to me if I didn't have good memories that went with it, but isn't that the case with a lot of the food we eat and love? I think so. to se ja često pitam za neke stvari... bi li bile tako dobre/bitne da nemam sjećanje. ovako je ustvari okus prilika da te podsjeti na neki dobar moment. i da prevariš vrijeme, ponavljajući nešto što je kao neponovljvo. e i još sam htjela reć kako skroz drukčije zvučiš na engleskom... a možda sam ti to već nekad prije negdje rekla.